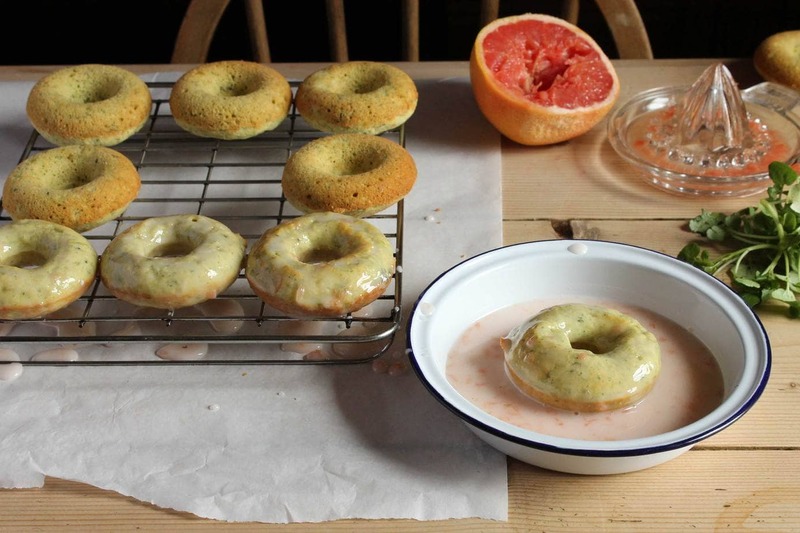 I put watercress in doughnuts. Indeed. And I’ll do it again. 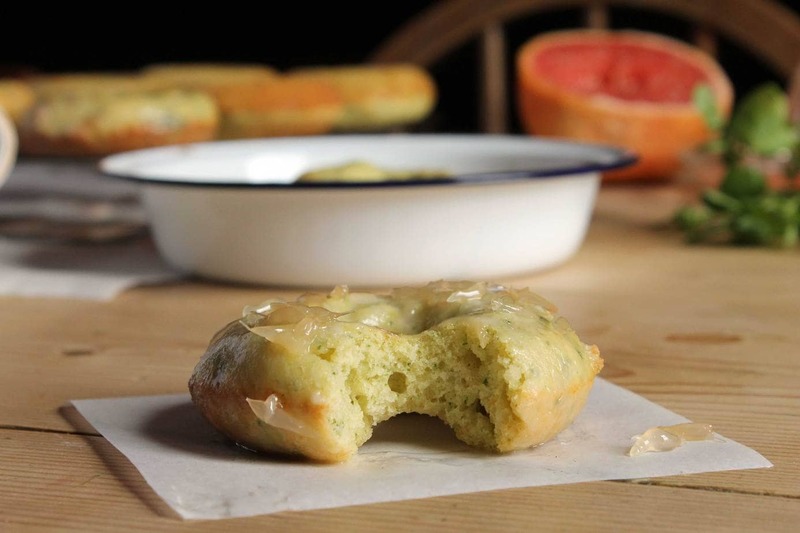 These zesty grapefruit baked doughnuts are vibrant, green-flecked spongy bursts of summer. 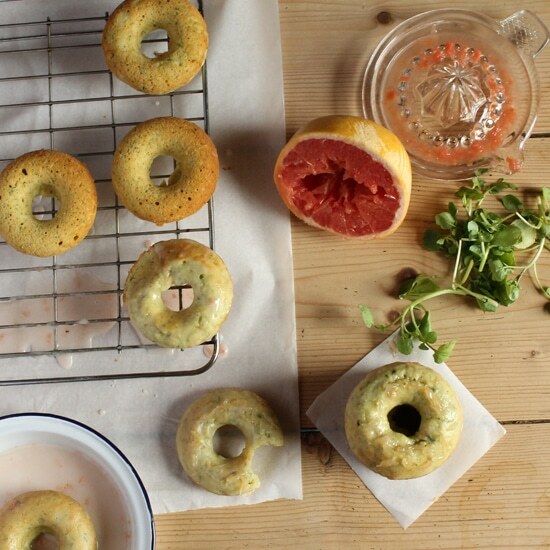 When cooked, the watercress loses the pepperiness and turns more floral, lending these doughnuts a subtle earthiness to compliment the gutsy kick of the fruit. What are grapefruit pearls, you ask? I discovered them from the food Gods over at Saveur and they are little tangy bubbles of sunny citrus. 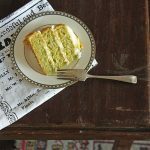 So simple to make, they are a quirky, healthy alternative to sprinkles. Thursday was not a pleasant day. Double disappointments, wallowing in self-pity and Bob Marley’s Legend on repeat. Friday dawned a little brighter. I had a quiet word with myself. Someone’s mother said “What’s meant for you won’t pass you by.” It helped. Today, however, is great. The sun blazed all day, and now I’m rambling on my computer to you while drinking Pimm’s. My glass (okay, it’s a jar, but I swear I’m only using it because the other glasses are all in the dishwasher. My grandmother would be horrified.) is rammed full of ice, lemon, strawberries, fresh mint and cucumber. 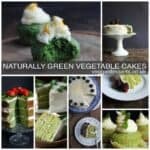 So, it’s sort of a veggie dessert. My husband is in the dining room with the exposed skeleton of a Victorian grand piano dismembered around him. He’s listening to Chilly Gonzales while hacking away at pieces with small vintage tools like a gin-soaked (Pimm’s-soaked) eccentric. Sweeney Todd with a tuning fork, if you will. A hundred years of the dust of dead people who hit keys in the succession to make tunes dances ghostly in the air as he tinkers and mends, prodding the music back into the wood. He is a piano tuner. I’ve encouraged him to sport a handlebar moustache, but thus far he is not keen. * I have a broken rib from an over-enthusiastic coughing fit three weeks ago. * I would like to see a barbershop quartet one day. Make it happen, someone. * My house is up for sale and I’ve cleaned it more in a week than in all of 2013. Preheat oven to 175C/350F. Grease a doughnut pan. Simmer the watercress for a few minutes until tender. Drain, refresh under cold water, squeeze out the moisture and puree with a hand-held blender or food mill. Set aside. In a large bowl, whisk the flour, sugar, baking powder and salt. In another bowl, whisk the watercress, egg, oil, buttermilk, butter, zest, juice and vanilla. Add to the dry ingredients and gently stir to combine but don’t overmix. Fill the doughnut moulds with the batter until nearly full and bake for 15 minutes or until springy and an inserted skewer comes out clean. Allow to cool in the tray for 5 mintues, then carefully remove from the pan to cool completely on a wire rack. Peel and segment the grapefruit over a bowl to catch the juices (reserve for the glaze). Put the segments in a bowl and cover with olive oil. Gently stir, occasionally. After about 15 minutes the grapefruit will dissolve into pearls. Strain the grapefruit (reserve the infused oil for salad dressings) and rinse under cold water to remove traces of oil. Set aside. Mix both ingredients until smooth, adding more juice to make a thin consistency. Dip the fully cooled doughnuts in the glaze and allow to cool on a wire rack. Top with the grapefruit pearls. Notice that coffee ring on the table? Oops. Caffeinating between shots. I get a veg box every week and sometimes have things left over that I’m not quite sure what to do with. 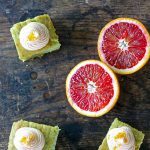 This week I had four grapefruits which were too much for me to eat on their own so I searched for grapefruit desserts and came across this one. I happened to have everything already, including only one egg, just one teaspoon of vanilla paste left and (can you believe it) my other veg box loner, a bag of watercress! I messed up the batter slightly, it didn’t seem runny enough so in my infinite wisdom decided to add more grapefruit juice, I THEN remembered the butter was still in the microwave. I’m going to blame the distraction of baking them with a two year old. I don’t have a doughnut tray so I improvised. The first half went into mini muffin cases, the second half I added chia seeds and used a yorkshire pudding tin. Both are delicious, but I had to add more sugar over the top of the glaze and grapefruit pearls because they are pretty tart due to my previously mentioned idiocy. 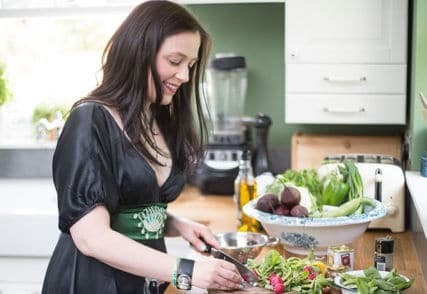 GREAT recipe though, I’ll definitely be checking out your other blog recipes and the two year old is similarly impressed. Ha, sometimes baking with kids around is just crazy! Glad they turned out in the end! 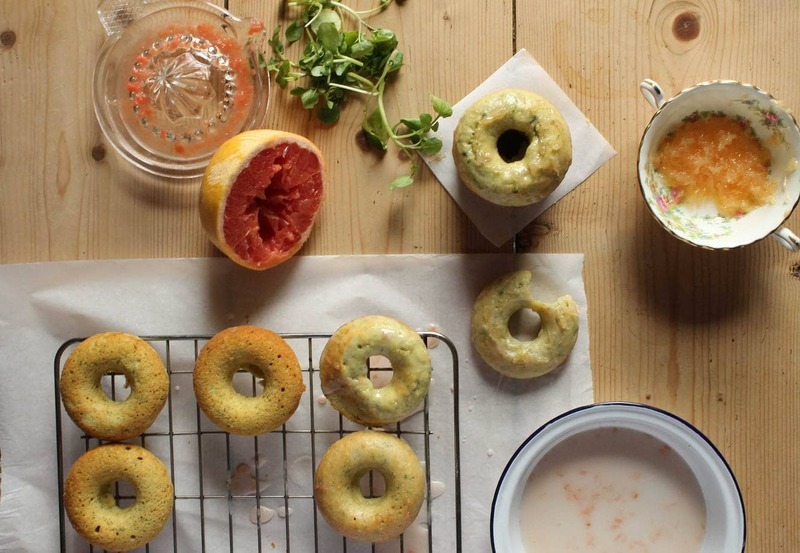 What a creative doughnut recipe! I really would love to taste them. Thanks Angie. They’re really easy and good. I hope you get the chance to make them one day! I’m not a fan of raw grapefruit but I’m intrigued by this! 🙂 Going to scour Amazon for that doughnut tray & let you know how I get on! Baked doughnuts are great! Buy buy! Thanks Choclette! For all of your ongoing support. You rock. Your desserts are so innovative and lovely at the same time. The wonderful thing, though, is that you’re a beautiful writer, as well. Thank you for the bright spot in my day when I read. Glad you’re keeping it up! Hope your rib is healing well, too. Gosh, Melissa. That is such a kind thing to say. You’ve absolutely made my day! This would definitely be a fun place to start! This looks amazing! I love grapefruit, and I bet these taste delicious! 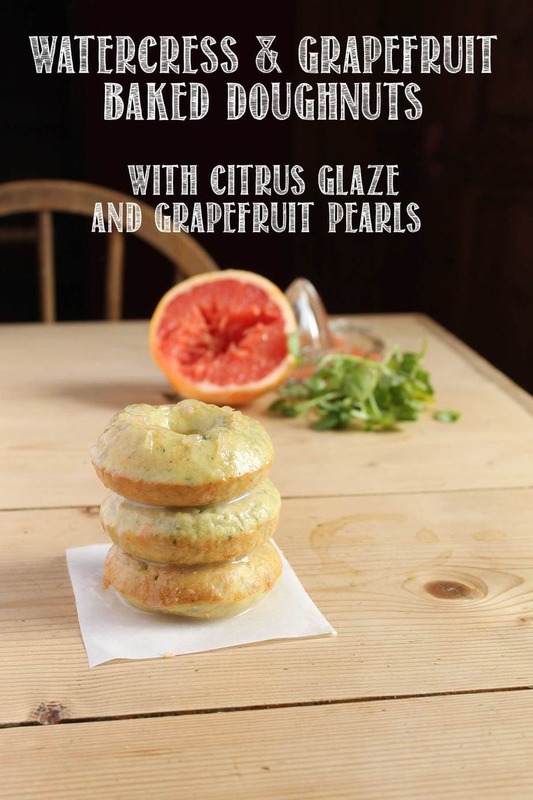 Grapefruit is so lovely in the mornings, now it’s lovely for dessert! I must say, these look so good my family… non-veg eaters would completely go nuts over these doughnuts! They are so sweet and inviting looking! Wonderful! Thanks Kecia, they’re delicious – nobody would know there was a big bunch of leaves in it! Thanks Mel! I fear the disappearing doughnut gif is going to start a gif obsession…! So easy! I bet it would work for other citrus fruits, worth a try! Kate, you are simly amazing! 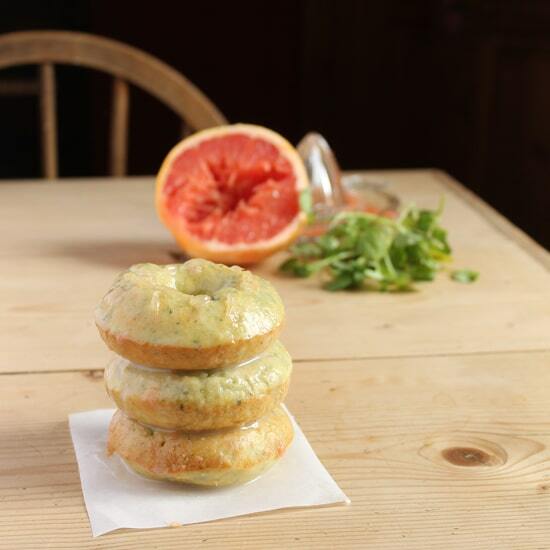 Watercress in doughnuts, very interesting! And the citrus pearl tip is really smart. Best of luck for the award.